If only you could surf the band without retuning all those stages. What to do, what to do? What if we could take an arbitrary frequency, push it through a black box, and have it come out as a common frequency with all the intelligence (modulation) intact? If we could do that then all the stages down the line could be optimized for that frequency. No retuning of downstream stages necessary as we always work with the same frequency no matter what frequency we want to listen to. All frequencies would be translated to this one frequency – the “intermediate” frequency. So what is the black box that can accomplish this? It can be shown mathematically that two sine waves when mixed (non-linearly) together produce products that include the original two frequencies plus the sum and the difference of the original frequencies plus a bunch more products. You get some other artifacts out the mixing process but the details of this is not relevant to the discussion of the basic principle. The great thing about mathematics is that it can model reality (why is this true.?) And, when you do the experiment and superimpose or beat two waves together you do in fact get, in reality, the result that mathematics predicts. This is the essence of the heterodyne principle and the desired black box above. As applied to AM radio receivers, the technique it to mix the frequency of a local oscillator (LO) against the incoming rf signals. The outputs of the mixing process that are the sum and the difference of the rf signal and the local oscillator. This is what we are interested in. This is the Intermediate Frequency that will be used in the following stages of the receiver. After consulting the Oracle at Delphi, radio engineers decided that 455 KHz would be a good (IF) Intermediate frequency for the AM broadcast band. Lets see how this works. 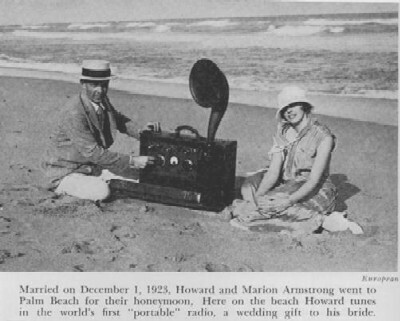 Suppose we want to listen to 620 KHz in the AM broadcast band. If we set our local oscillator (LO) to 1075 KHz and then throw these two signals into the magic black box (nonlinear mixer) we would get as one of the products 455 KHz – just what the Oracle at Delphi recommended. Note that 1530 KHz also produces the magic IF of 455 KHz when mixed with a LO of 1075 KHz – that’s the image frequency and its good and bad that it is there. It is bad because we might not want 1530 KHz interfering with our enjoyment of 620 KHz. Its good since you might want to listen to image frequencies on radios that were designed not to receive these frequencies. In the first case, both 620 KHz and 1530 KHz mix with the LO of 1075 KHz to produce 455 KHz. How do we get rid of the 1530KHz signal? We could do it before it hit the mixer using a tuned circuit. That is how traditional receivers do it. They use a ganged air dielectric tuning capacitor to simultaneously control a tuned circuit ahead of the mixer and to tune the LO itself. So, bottom line, a LO that can tune 990 KHz to 2160 KHz will cover all of the AM broadcast band when we mix this LO signal with RF in the spectrum 550 KHz to 1700 KHz. For some frequency in the LO range the mixing (heterodyne) process will produce a 455 KHz Intermediate frequency. If the next stage is a narrow filter on 455 KHz then we have the AM broadcast signal we want eliminating all/most of the other mixer products. We further process this 455 KHz signal, extracting its intelligence and we will can optimize all the circuits to this single IF – no matter which AM broadcast station we tune. This overcomes the design limitation of the Tuned Frequency Receiver and it is the essence of the Superhetrodyne process which translates the desired receive frequencies to a common Intermediate Frequency. 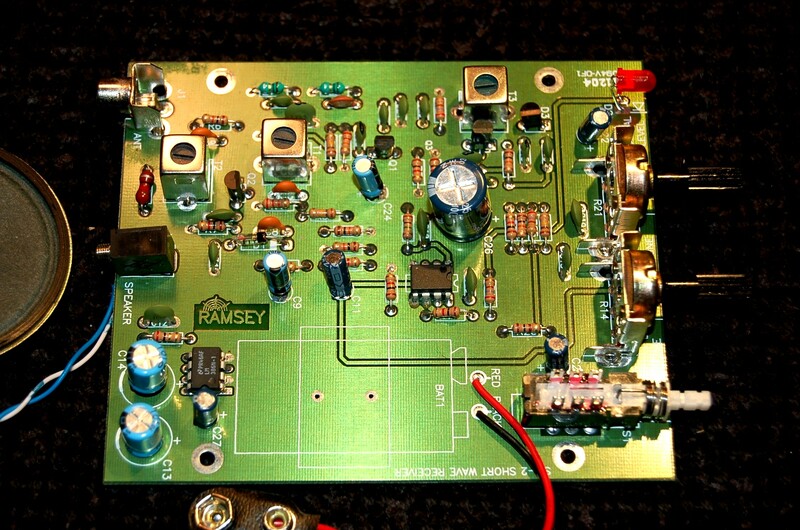 The Ramsey Shortwave Receiver kit is a bare bones demonstration of the Superhetrodyne receiver design. The cost for the kit is about $45. 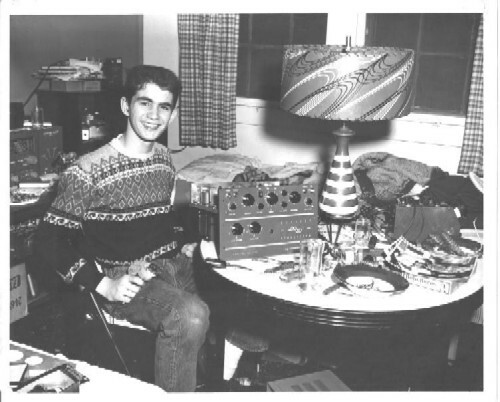 It can be built in about 2 hours and it will receive AM in the range 4 MHz – 19.5 MHz. The key to tuning 4 MHz to 19.5 MHz is to play with the LO. To get that tuning range you want you need to tweak the local oscillator to get it to oscillate in the range that produces the right IF in the mixer for the SW station you want to receive. You change the range of the LO through a continuous tuning control, swapping some capacitors, and/or adjusting an inductor. But, its all about the LO and the mixing (heterodyning) process. The receiver is built in sections that roughly follow the functional block diagram of the radio. The frequency of the local oscillator is the function of an inductor, a couple of capacitors, and a varactor diode. There is an inductor that is really part of a transformer, two fixed capacitors, and a varactor diode. A varactor diode is a device that can deliver a capacitance based on the level of applied reverse bias voltage. So, “tuning” this SW radio is accomplished by varying the reverse bias on the varactor using a pot to fine tune capacitance (via a reverse bias) and by turning a slug on the inductor to fine tune inductance. The capacitance and inductance determine the frequency of the local oscillator. You can see C15 and C16 as marked. 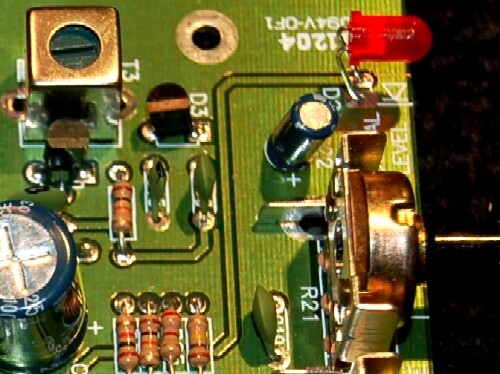 The black blob in the foreground is Q3 tin he schematic, and the black blob in the upper left is (D3) the varactor diode. The silver can is the variable inductance and you change its value by turning a slug with a nylon tool. 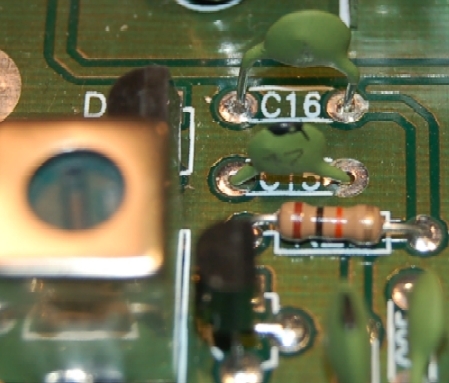 The pot that controls the reverse bias on the varactor diode is over to the right (R21) on the image above. Let me again say that this is a bare bones kit primarily used to demonstrate the Heterodyne principle and for casual SW listening. You will have to swap a couple of capacitors to get the range you want out of the LO. Capacitors C15 and C16 plus the slug in the inductor control the LO frequency. This is the frequency that mixes with the incoming rf signals. It”s all about the LO. 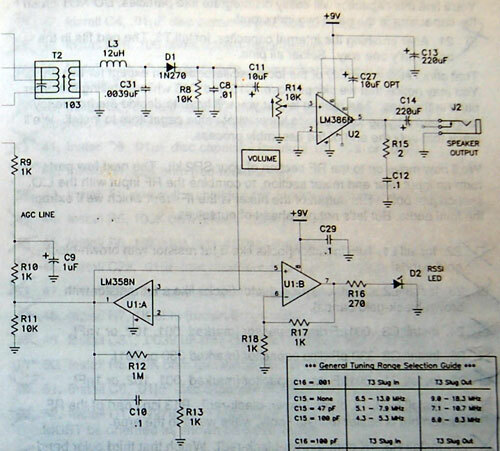 Speaking of the incoming RF signals take a look at the schematic. You will notice that the only thing before the mixer is a basic band pass filter (C1,C2,C3,L1,L2). What is missing is any tuned front end. So, we have quite a collection of signals that are being mixed with the LO. But based on the heterodyne principle, there will be a frequency and its image that will make it through the mixer producing 455 KHz. Note the simplicity of this design. You can clearly see the path of the rf from the antenna, plus the output from the local oscillator being fed into the mixer (Q1) and then the output from the mixing process being fed into the IF filter (T1). As Einstein said, “Things should be simple, but no simpler.” So there you have it – the heterodyne process in the flesh. We select that frequency pair (freq and its image) by filtering the output of a mixer at the IF of 455 KHz. We now have the desired RF signal and its intelligence. Next is an amplifier optimized for 455 KHz. This amp also includes a feedback loop to control its gain (AGC). The following stage is another IF filter at 455 KHz. This further cleans up the signal to get rid of any unwanted products. Our SW radio audio is riding on this IF. Using a diode and capacitor we can extract (detect) the audio signal. The next stage is to amplify the signal using an LM386 audio amp. Then, out to the speaker. The circuit also contains an dual op amp in a single IC package. One Op Amp in the package samples the level of audio after detection and uses this to control the gain of the IF amp. The second Op Amp samples the signal strength at the IF amp to drive the brightness of an LED. This LED serves as a signal strength indicator of the received signal. So there you have it, a shortwave radio that covers roughly 4 Mhz – 19.5 Mhz you can build in about 2 hrs and then use it to enjoy some SW listening. Not only that but you have a radio that demonstrates the heterodyne principle and all the stages of a radio that go into recovering the audio from the AM rf signal.